New Jersey Gov. 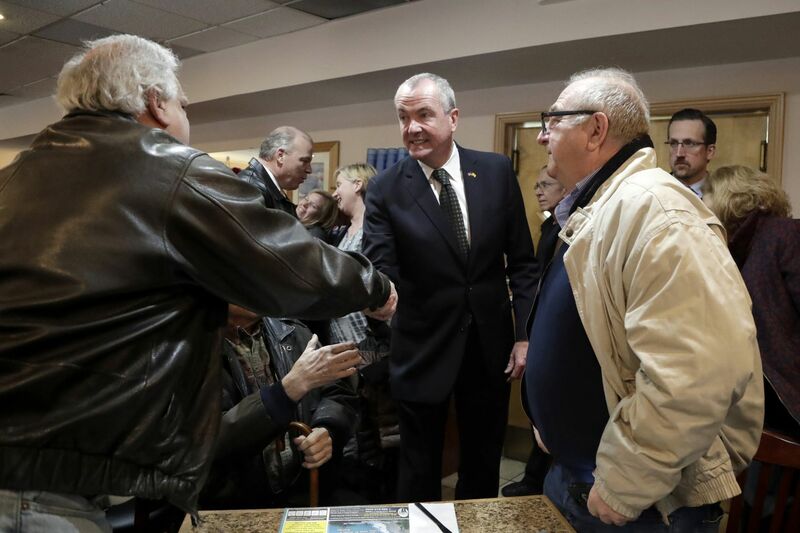 Phil Murphy (center) shakes hands with patrons at the Ocean Bay Diner in South Amboy last month before a news conference about the minimum wage bill, which Murphy signed into law Monday. As New Jersey’s minimum wage has risen through the years and business owners have protested their rising costs, one class of employer has been exempt: the government. The law that Gov. Phil Murphy signed Monday to raise the state’s minimum wage for most workers to $15 per hour by 2024 specifically includes the state, counties, municipalities, and school districts as employers under the law. Most of their full-time employees, particularly those covered by collective bargaining, already earn more than $15 an hour. But countless other public servants across the state will get a pay increase, including some library workers, park employees, lifeguards, student interns, laborers, and contractors. Burlington County expects to pay an extra $312,713 per year, mainly for entry-level election-board, human services, library, and animal shelter employees. Moorestown Township faces an extra $59,400 in wage expenses per year — a roughly 44 percent increase — mainly for recreational aides and laborers. Atlantic County is looking at an extra $182,000 per year, primarily for entry-level employees. Michael Cerra, assistant executive director of the New Jersey State League of Municipalities, said a parade of local elected officials approached him at an event last week with concerns about how the new law would impact their budgets. "A number of mayors came up to me, and they said, ‘They didn’t really do that, did they?’” Cerra said. His group, along with the New Jersey Association of Counties and the New Jersey School Boards Association, took no official position on raising the minimum wage. But they believe local governments should be allowed to act according to their individual budgets and unique circumstances instead of being forced under state mandate to increase their wages. About two dozen states exempt some combination of federal, state, or local government employees from their minimum-wage rules, according to a 2018 analysis of laws by Business & Legal Resources Inc., an information services company. “In our case, the employers are the property-tax payers,” Cerra said. “That warrants special consideration." New Jersey is the fourth state — behind New York, California, and Massachusetts — to raise the minimum wage to $15 an hour. New Jersey’s current minimum wage is $8.85 and annually adjusts for inflation. More than one million workers in the state will get a salary boost, according to the governor’s office. In some communities, the law’s impact will be minor, Cerra said. Gloucester and Cumberland Counties' costs would be insignificant, officials there said, because both have passed their own “living wage” resolutions to increase employees' pay. All the municipal workers in Cinnaminson Township in Burlington County already earn at least $15 per hour. It’s not just about this law, local officials said, but the new mandate on top of other recent state actions or inaction that are raising costs for local governments, they said. That includes state lawmakers letting expire a 2 percent cap on awards to employee unions through binding arbitration, the governor signing a law last year that strengthened public worker unions, and lawmakers allowing the sunset of a law that restricted unions' bargaining over employee contributions to medical benefits. “The totality of these bills is just a recipe for taxpayer disaster two or three years down the road,” said John Donnadio, executive director of the New Jersey Association of Counties. The municipal, county, and school district groups said the state’s 2 percent cap on property-tax increases leaves local governments with few options to pay their increased costs. Dennis Levinson, county executive of Atlantic County, said a “substantial workforce" there wasn’t making $15 an hour, including farm workers and seasonal workers. For a county reliant on tourism dollars, which in turn depend on the whims of the weather, the impact of the minimum-wage law as a whole is worrying business owners, Levinson said. For county employees, starting salaries for certain types of jobs are in the high $20,000s to low $30,000s, Levinson said. A full-time worker making $15 an hour under the new law can expect to earn about $31,200 annually. “We won’t know the effect of this until it is fully implemented," Levinson said.